Andy Murray’s march into the quarter-finals of the Australian Open has seen the British enthusiasm heighten ten-fold as Britain looks for its first male Grand Slam winner since 1936. Usually the hype surrounding Murray is entirely unjustified, but after entering the tournament as the number five seed the pressure seems to be off Murray’s shoulders and the Scot is a better player for it. At the start of the Australian Open, Murray was 8/1 to win the tournament but following a string of comfortable straight set wins, Murray has been backed into 9/2 to win his maiden Grand Slam. And the draw couldn’t have proven more favourable for Murray after Robin Soderling was knocked out by Alexandr Dolgopolov, and Murray is the 1/9 favourite to beat Dolgopolov in the quarter-final and set up a potential semi-final with Rafael Nadal. Murray has only met his opponent once before and that came on clay in a Davis Cup match back in 2006. The Scot ran out a comfortable 3-0 winner on that occasion and with Australian Open odds of 4/6 to beat Dolgopolov 3-0, he is expected to once again. Nadal is undoubtedly the danger in Murray’s draw and the Spaniard is the 11/8 favourite to win the competition with Roger Federer available at 15/8. But Nadal’s fitness is under scrutiny following a bout of the flu in Doha, and Nadal seems to still be suffering from the virus in Melbourne. Should Murray face an under-strength Nadal in the semi-final, on the basis of his current form Murray can be considered a real danger to Nadal’s attempts to hold all four Grand Slam titles at the same time. David Ferrer is up next for Nadal and the world number one is expected to cruise past his fellow countryman. 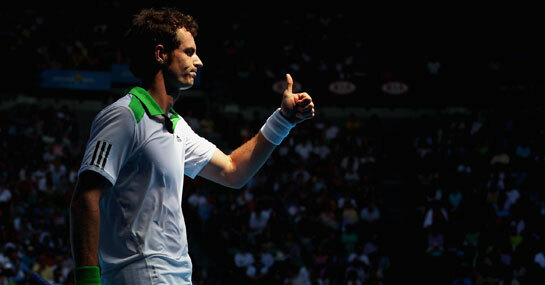 A £25 stake on Murray winning the Australian Open would return £137.50. New customers can sign up here for a free bet worth £25.